In 1966 York College was founded as a four-year ("senior") college within the recently formed City University of New York (CUNY). After much initial debate over the location of the school, South Jamaica was chosen in 1971 with the hope that the college would serve as a cornerstone of the ongoing revitalization plans for the neighborhood, which were supported by the Jamaica Steering Committee and Mayor John Lindsay's administration. For many, the selection of South Jamaica demonstrated CUNY’s commitment to placing a four-year school in an underserved, largely black, Queens community. And though the economic turbulence of the 1970s would come to threaten both the college’s four-year status and its overall existence, its continued presence speaks to the important role York has played in the neighborhood over the years. The "York College and the Jamaica, Queens Community" collection largely focuses on the 1970s and contains news clippings related to the college’s early development in Jamaica, selections from the student publication Spirit Magazine, and documentation of the college’s urban planning and community leadership program designed for the South Jamaica community. The majority of items are selections from Spirit Magazine, the publication that focused on issues that students of color faced at York College. 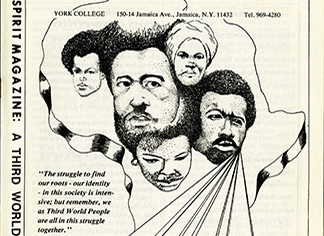 Spirit contained articles, poetry, artwork, opinion pieces, and promotion for events on black solidarity, Pan Africanism, and protests against discriminatory acts committed by York College. Its editors always held the goal of promoting strong ties with the South Jamaica community. The college’s emphasis on community extended to include the creation of curriculum designed to uniquely prepare the residents of South Jamaica for the burgeoning professional opportunities resulting from the area’s redevelopment efforts. This curriculum came to form the basis of the “Urban Training Program,” a federally funded project in which York College and the Jamaica Steering Committee trained two hundred Jamaica residents in the hopes of cultivating community leadership. Curated by Obden Mondesir, this collection features a mix of newspaper articles, press releases and student-produced material, all of which show CUNY's efforts to carry out its mission to provide education to all New Yorkers, particularly through the placement of York College in Jamaica. It also documents meticulous collaboration between community leaders and CUNY and the student voices that provide a critique of the York College administration and their approach to addressing issues that minority students faced. Go to all 23 Items in collection.